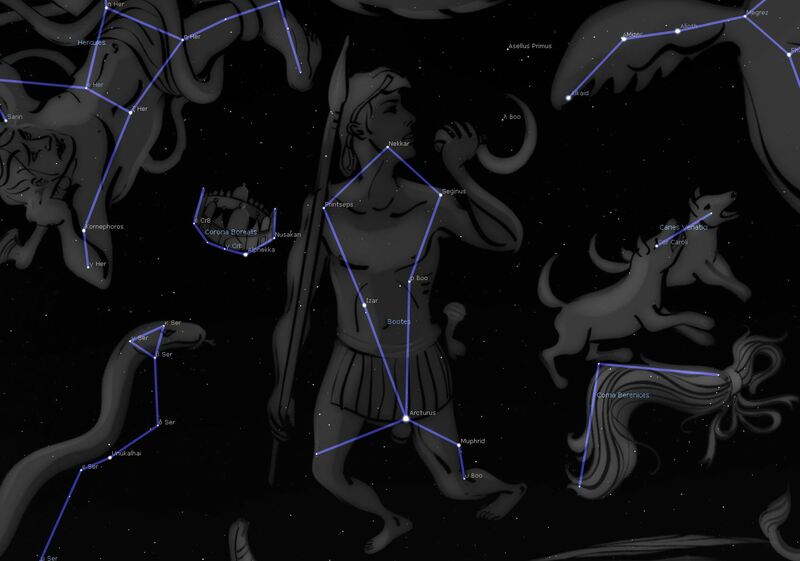 A typical springtime constellation is Boötes, the Shepherd – a large and very noticeable constellation, which is best observed during the Spring. The northern part of the constellation can even be seen year round at more northern latitudes. The name describes a man, walking in a slouched position, as if to not alert bears to his presence. At first sight, the constellation appears to resemble an icecream cone or a kite, rising in the wind. The shepherd is also known as the bear watcher, since he is found just to the southwest of Ursa Major (the great bear). Following the handle of the big dipper down makes finding the bear watcher an easy task. Several bright stars are found within the constellation. After finding the corona borealis (the northern crown), you will see Boötes just to the right. Boötes stretches across 907 square degrees, which means plenty of celestial objects call it home, such as the fourth brightest star in our night sky, Arcturus. This star is in its end stages of life, giving it a noticeably orange flicker. The twin star, Epsilon Boo (a9372) can also be found in the shepherd’s domain. Izar von Pulcherrima, another name for the double star, can be seen with a 75 mm telescope, which can help the observer appreciate the colorful contrast of the stars. Other similar stars, such as Zeta Boo, consist of two stars of 4.43 and 4.83 mag, or even kappa Boo. Something special to see in Boötes are its meteor showers, taking place in January and June. From the 9th until the 18th of January and the 27th June until the 5th of July, meteor showers provide an exciting show for onlookers. Other stars and some galaxies – often only visible with large telescopes – can also be found in this special constellation. Gazing into the night sky, best with a good telescope, is worth the time and effort. Many different legends surround the mythological background of Boötes. The bear watcher was supposedly a son of Zeus: Arkas, whose mother, Kallisto, was transformed into a bear by Zeus, in order to protect her. As a result of his mother’s transformation, Arkas almost unsuspectingly kills his own mother. Before carrying out the deed, Zeus transformed Arkas into the bear watch. Another legend states, the bear watch is supposedly Icarius, whose occupation as a vintner lead him to the misfortune of coming across a group of wanders who misunderstood his drunken state as poisoned. As a result the group slayed the vintner, with his daughter taking her own life shortly thereafter. In order to reunite the two, Zeus sent both to the heavens: the daughter as a bear and her father as the bear watcher.